The following is a statistical analysis of the data provided by the Albanian Institute of Statistics as of June, 2011. 1- Data is current only until 2007. 2- Notice the decrease in books entered into the National Library from 2002-2007, despite an increase over the years 2004-2005. 3- There is an overall increase of registered readers at the National Library, more than double the amount from 2002 to 2007, however the amount of books used by readers has decreased by 27,000 from 2003-2007. This indicates that the same books are continuously drawn, and is an aveage of 5 books per registered reader for 2007, compared to 9 books per registered reader in 2005, and 11 books per reader in 2003. 4- Fund of exemplar books, no data after 2005. 5- Number of activities at National Library is 62 less in 2007 than in 2003, and in 2005 reached a low of 56 activities. 6- Data for district libraries stops after 2004. 7- As of 2004, there were 51 district libraries containing a total of 2,331,000 books. 8- That year, 2004, the 51 district libraries registered 63,169 readers and 172,000 reading room users. The National Library registered 13,775 readers at the National Library in Tirana, and 130,000 reading room users. * If there were only 13,775 registered readers at the National Library, what were the other 117,000 people doing in the reading rooms?!!! 9- In 2004, the number of reading room users at the National Library increased by 70,000 users to 130,000 users. When the data stops in 2007, the total reading room users was registered at 107,000 users. 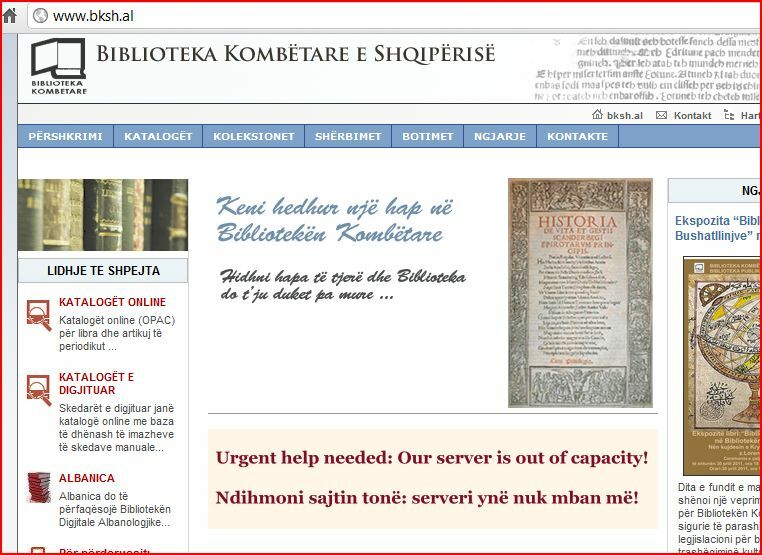 1- There was no law regarding libraries in Albania until 1999. The law was passed by parliament in 2000, and guarantees free access to information and considers each library as a part of the National Information System. 2- The legal deposit act on 1922 (last modified 1994), states that 5 copies of every printed matter is to be sent publishers without charge to the National Library, and 5 copies of every book printed within a municipality to be sent to municipal libraries. 1- Library Act No 8576 (approved 2000), provides the legislative and the institutional framework for libraries and recognises the role of the Ministry of Culture, Youth and Sports to provide strategies and policies for the development of the national system of libraries, regardless of which other authority or agency is responsible for them. 2- The book sector still functions mainly through funding from NGOs or Foundations (Soros, Fan Noli Fondation). Comments about the National Library of Albania at the conference “The Role of Libraries in knowledge-based Information society” in December, 2010. 1- The National Library is not user friendly, both in terms of system and staff. 2- The staff withholds books, sometimes asking for money in order to borrow a book. 3- The staff appears to have been appointed for reasons other than knowledge or expertise. -9 of 13 use @yahoo.com, with the rest using hotmail or gmail…none have a state issued email address. 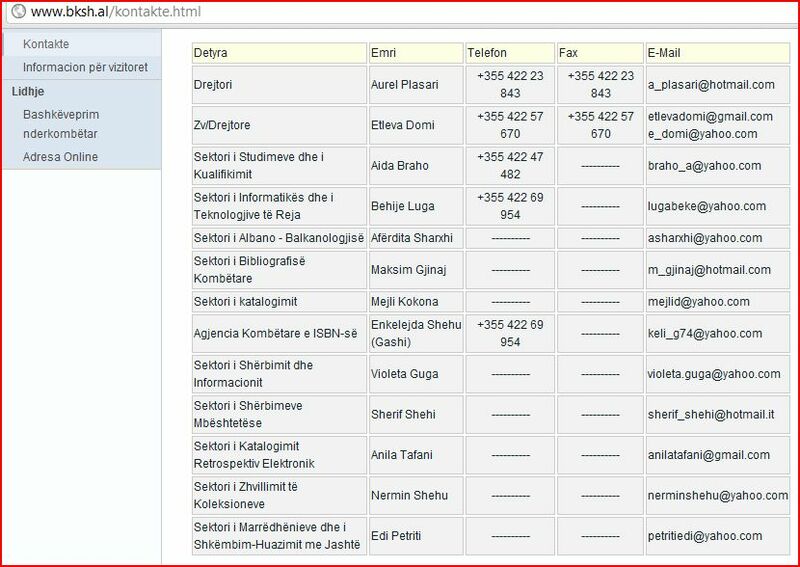 Even the Director, Dr. Aurel Plasari uses a hotmail account while running the National Library of Albania. -8 of 13 contacts do not have a phone number, including the Service and Information sector.